Synopsis: Since a deadly virus and the violence that followed wiped out his parents and most of his community, Finn has lived alone on the rugged coast with only his loyal dog Rowdy for company. 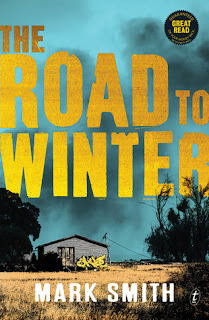 The Road to winter was a well paced and fun read. It didn't take long to read at all. This book gave me a lot of Tomorrow when the war began by John Marsden vibes but was also different in so many ways which is awesome because there are some books i've read and you really have to think if you've already read the book as it sounds so familiar. One thing you should take into consideration if you decided to read this, it is apart of a series which I didn't realise until I had almost finished the book, oops. If you are someone who enjoys a good post-apocolyptic read then this one is for you or maybe you've never ventured into this kind of genre before and must say it's a good place to start! Warning! Some minor spoilers ahead! Now to go into a bit more detail. In the book it talks about this virus that has killed so many people, it's been 2 years. So where is the Aid? Is nobody going to help them out, and what caused the virus in the first place. So many questions. Rose seemed to use Finn a lot and she never seemed to tell him the full story. Rose's character for the most part got on my nerves, I can't fully explain it but one of the main things that irked me was when she would call Finn "Dog Boy". I would hate someone giving me a name like that. Something that I didn't pick up on and honestly I don't know how I didn't was Rose being pregnant. It was basically spelled out for me to but I just didn't see the signs. I quite liked our main character Finn, he didn't make to many rash decisions and he was quite mature for his age. He knew how to look after himself and he didn't let his situation get the best of him. I also really liked to read Kas' character, I never saw her as a damsel. She could take care of herself, Kas was pretty awesome. Two big question I hope will get answered in the next book is Will Willow get reunited with her Parents? Are they dead? Also how in the world are they going to get Rose's baby back? Overall I quite enjoyed this and I will definitely look out for the next installment.